The college celebrated Hillda’s 40th birthday in May, 2016, with a specially made oat and carrot cake. 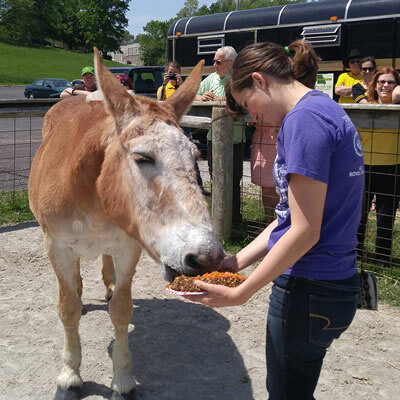 MU College of Veterinary Medicine faculty, staff and students said farewell to Hillda, one of the original members of the college’s Mule Team, earlier today. The mules serve as goodwill ambassadors for the CVM and Mizzou. 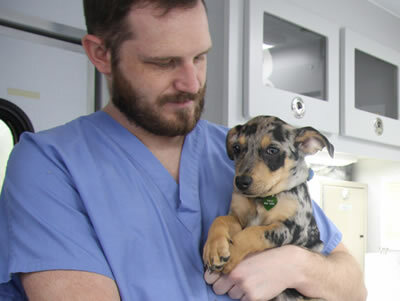 Due to Hillda’s advanced years and deteriorating health, a team of veterinary professionals determined that euthanasia was the most humane course of action. Hillda and her mule team partner, Louise, came to the college in 1984. Dr. Robert Kahrs, who was then dean of the veterinary school, purchased the mules from a Howard County farmer and brought them to Columbia to become the school’s mascots. A gift from Hill’s Pet Nutrition financed the purchased, and Hillda’s name was taken from that of the company. As the official college ambassadors, Hillda and Louise traveled throughout Missouri, attending an average of 50 events per year. For 12 years, they participated in parades and picnics, visited petting zoos, gave wagon rides, and raised awareness of the state’s mule heritage. They also served an integral role in the veterinary education of students who participated in the college’s Mule Club. Mule Club members exercise, groom and feed the mules. In 1996, a second team of mules was purchased, allowing Hilda and Louise to enjoy a well-deserved and peaceful retirement in the pasture behind the college’s campus. While the two mules were officially retired, due to their gentle disposition, they continued to be included in college tours, greeting countless schoolchildren who visited the campus. Louise passed away on June 23, 2011 at 35. Members of the Mule Club are discussing ways to memorialize Hillda and Louise. Memorials in Hillda’s honor may be sent to the MU College of Veterinary Medicine Office of Advancement W213 Veterinary Medicine Building, Columbia, MO 65211; or by calling 573-882-1902.